Our supermarket is currently undergoing a major remodel which is highly annoying because it means that everything is in the wrong place and in order to ensure that I find everything that I need to cook the meals for the week we have to go down every aisle and look at every shelf in order to make sure that we aren’t missing something important. This is compounded by the fact that everyone else has to do this as well resulting in significant traffic jams as people stare blankly at bags of potato chips that are now sitting where the olive oil used to be. The up side to this mess is that I have seen a number of new things that I probably would have blown right past which have made my new year’s resolution of trying something new a lot easier. For instance, while staring blankly at the spot where the Stella Artois used to be, I was confronted with this beautiful label of a beer from Goose Island brewery in Chicago. I have had a few of their beers in the past, both when traveling through Chicago and when hanging out at Chicago themed restaurants, but this was a new one. 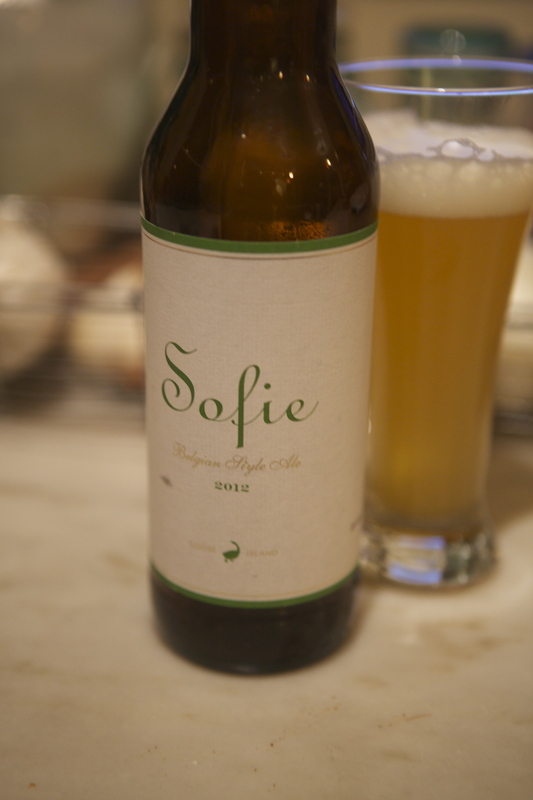 Sofie, according to the description at Goose Island’s site, is a Belgian style ale fermented with wild yeasts (learning that this works with beer as well as bread makes for some dangerous possibilities for a future experiment in home brewing), and orange peels. Reading the label, but not on the description on the web site, one learns that the finished product is a mix of 80% standard Belgian ale with 20% Belgian ale aged in wine barrels. While the description of the beer waxes poetic about vanilla and pepper notes among other taste phenomena, I can tell you that above and beyond the flavor of a very nice wheat beer, the thing that comes out most is a light citrus flavor. This is a polite beer. And though I drank it from the wrong kind of glass (pilsner instead of a wide mouthed wine style glass), it was really pleasant. I can see this going well not only with the various and sundry types of seafood they mention on their website, but it would also pair nicely with a heavy, creamy dessert like a classic cheesecake, making it one of only a tiny handful of beers I would consider with dessert. This bottle did not last long as it also got the thumbs up from my wife and one bottle = 2.5 servings but I plan on buying another bottle and trying it out in place of dry white wine in sautéed spinach or other sautéed vegetables. Next I want to find a bottle of their Juliet … that sounds very tasty. Update May 29, 2018: Goose Island has been sold to InBev. Another one bites the dust. Goose Island is producing several beers in 650 mL bottles, including Sophie, Mathilda and Pere Jacques. Haven’t had a bad one yet. Some beer geeks (i.e., me) were worried when InBev bought out Goose Island back in 2011. But so far there hasn’t been any decline in the quality of their brews. Plus, it means they’re getting distributed in more markets. How has Dominion Brewing fared since the InBev/Anheiser Busch merger? Sorry for the delay, just saw your response. Apparently the InBev/AB purchase is all about distribution rather than the brewing process. Old Dominion is still around, although their brewing operations moved to Delaware. Their Oak Barrel Stout is quite good. Thing is, there are are a ton of new breweries in this area. OD just doesn’t garner much attention. Their competition is stiff. There are three breweries in NE DC (3 Stars, Chocolate City, DC Brau), several in NoVa (Port City, etc. ), Frederick (Flying Dog), and of course Baltimore has several great brewers (Brewers Art, Stillwater, etc.). It’s not that Dominion is bad, but there’s a lot going on and they’re just not commanding much attention.